SARATOGA, Calif.--(BUSINESS WIRE)--It was six years ago today when a small team at Roku® Inc. unveiled the streaming player, the very first device to stream Netflix to the TV. The innovation of delivering video over the Internet straight to the big screen in the living room shifted entertainment consumption and sparked a major consumer trend. In honor of the anniversary and the impact Roku has had on TV, Saratoga Mayor Emily Lo will today bestow the proclamation of “Streaming Day” at the Roku headquarters. 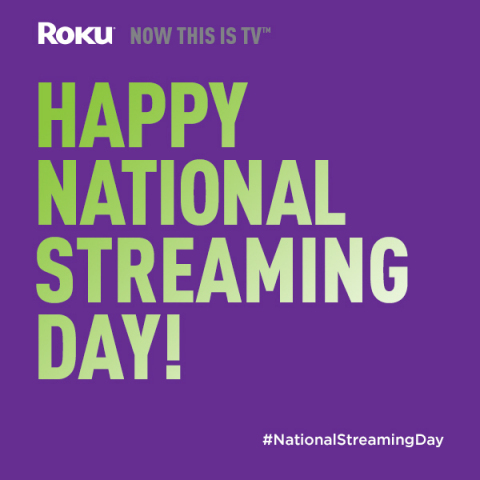 As part of the commencement Roku invites TV industry and consumers to forever celebrate May 20 as National Streaming Day #nationalstreamingday. During this new era of TV consumers enjoy on-demand entertainment like never before. As content creators have embraced the power of the Internet to stream to the TV they have emerged in several new categories. While movies and TV shows are widely popular categories, consumers also enjoy music, sports, news and weather, fitness and outdoors, science and tech, food, kids and family, travel, foreign language and religion and spirituality options. Yet more even notable is that streaming has enabled new channels – TED, The Autism Channel, Kaplan Prep, DogTV Anywhere and others – that would have never otherwise had a path to the TV. Roku anticipates that the pace of streaming entertainment available for the TV will continue to rapidly increase in the coming years to the point where all TV will be streamed. Roku alone publishes roughly 90 channels per month to its platform. In celebration of National Streaming Day consumers are encouraged to stream at least 60 minutes of their favorite entertainment today and share their selection using hashtag #nationalstreamingday. Streaming TV fans can also visit Roku’s Facebook page www.facebook.com/Roku for fun facts and a chance to win prizes. 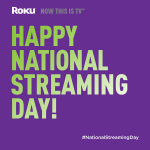 Those who don’t yet have a Roku player can buy one today and receive a $10 rebate by visiting www.roku.com/nationalstreamingday. Roku is the creator of the most popular streaming platform for delivering video, music and casual games to the TV. The Roku platform features the largest collection of entertainment available for streaming to the TV and is accessible through Roku streaming players, the Roku Streaming Stick, Roku Ready devices and later this year on Roku TVs. Roku products are sold in the U.S., Canada, the U.K. and the Republic of Ireland. Roku was founded by Anthony Wood, inventor of the DVR. Roku is privately held and headquartered in Saratoga, Calif., U.S.
Roku and Roku Ready are registered trademarks and Streaming Stick is a trademark of Roku, Inc. in the U.S. and in other countries.